The unassuming exterior of the pinkas. In case you weren’t sure, this is an old book! Click to enlarge. I do not exaggerate in telling you that when I discovered this book, I jumped up and down and ran around the archives making everyone look at my discovery. The next day I posted pictures of it on Facebook to share my excitement with everyone I’ve ever met. 41 likes and 33 comments later, I knew it wasn’t just me. This book is genuinely awesome. 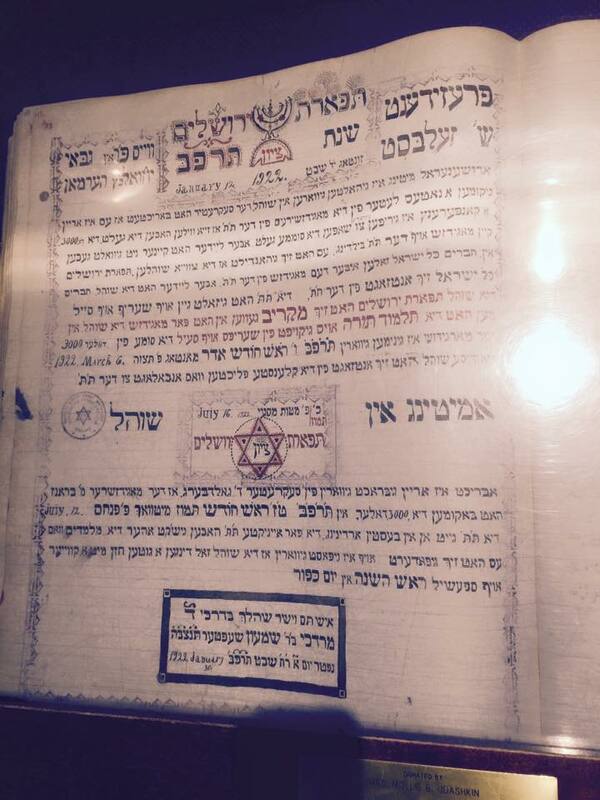 “Pinkas of the Chevra Kadisha of Homestead, 5677.” Click to enlarge. My heart leapt at the sight of the calligraphy and the illumination. Nowhere else in the Homestead records was such attention lavished on otherwise workaday records. To me it appeared a literal hiddur mitzvah, a beautification of the commandments to show respect to the dead and provide comfort to mourners. 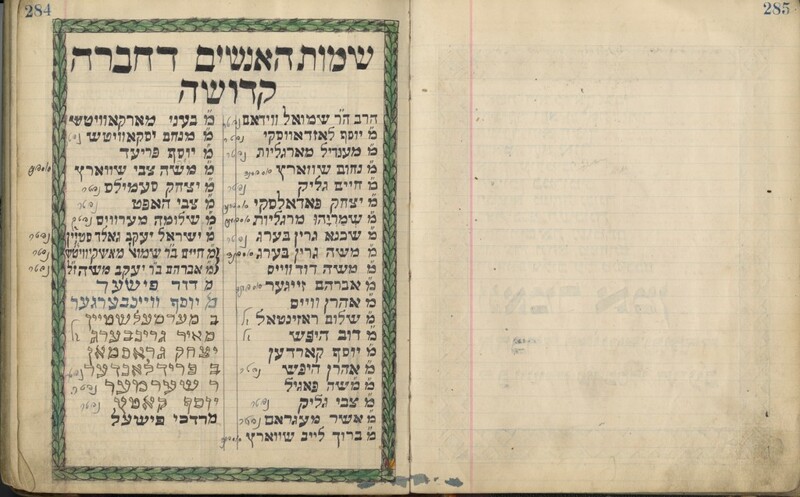 The special care they took with these records suggested to me that the Chevra Kadisha (“holy society,” the common name for a Jewish burial society) must have seen their work as unusually sacred amongst all the sacred work involved in running the congregation. 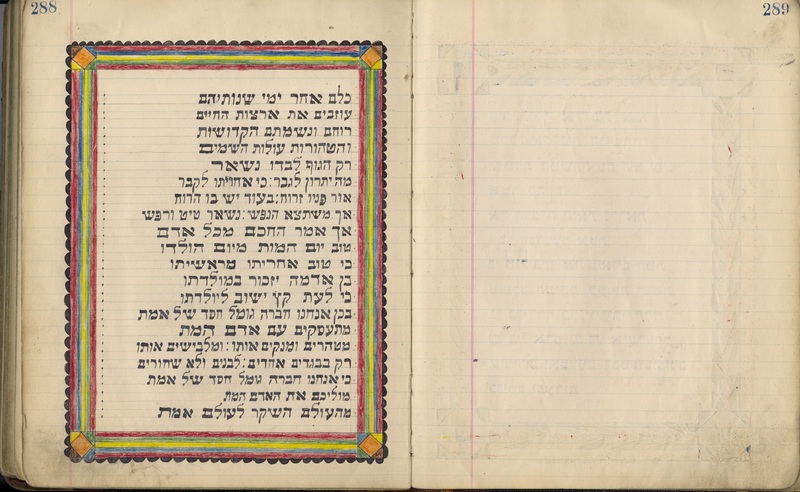 Register of a chevra? Check. 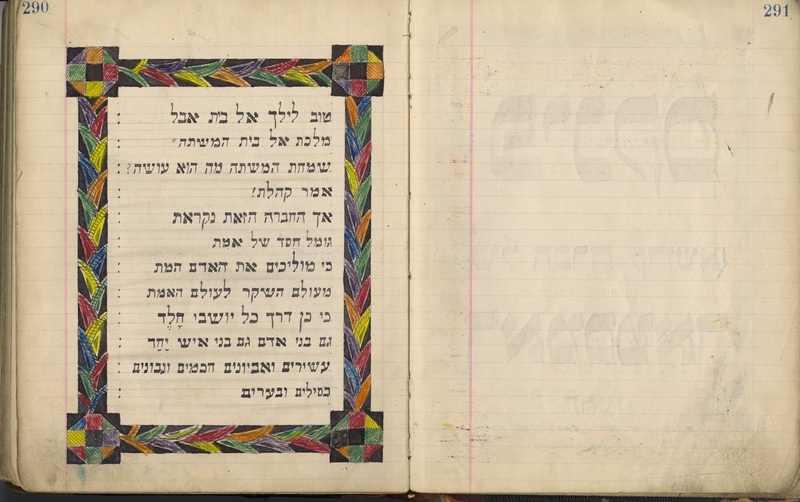 Torah-like lettering? Check. Illuminated pages? Check. Names of its founders and members? Rules and regulations? See below — check and check. “Names of the men of the Chevra Kadisha.” Click to enlarge. 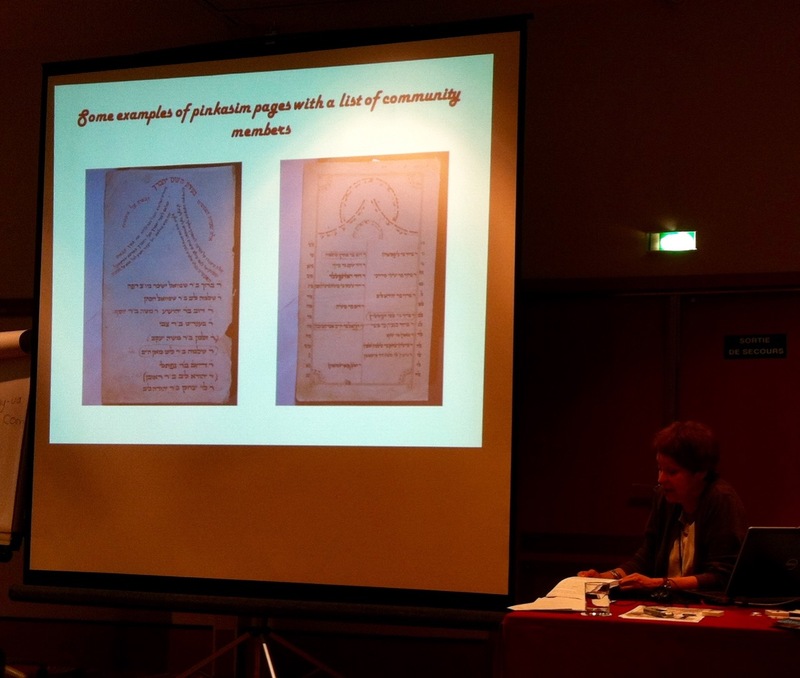 Right: “Names of the women of the Chevra Kadisha.” Left: “Takanot (regulations) of the Chevra Kadisha.” Click to enlarge. But before the names and rules and minutes, something quite unexpected appears: a three-page poem! First page of the poem from the pinkas. Click to enlarge. Second page of the poem from the pinkas. Click to enlarge. Final page of the poem from the pinkas. Click to enlarge. What does the Joy from Feast bring? 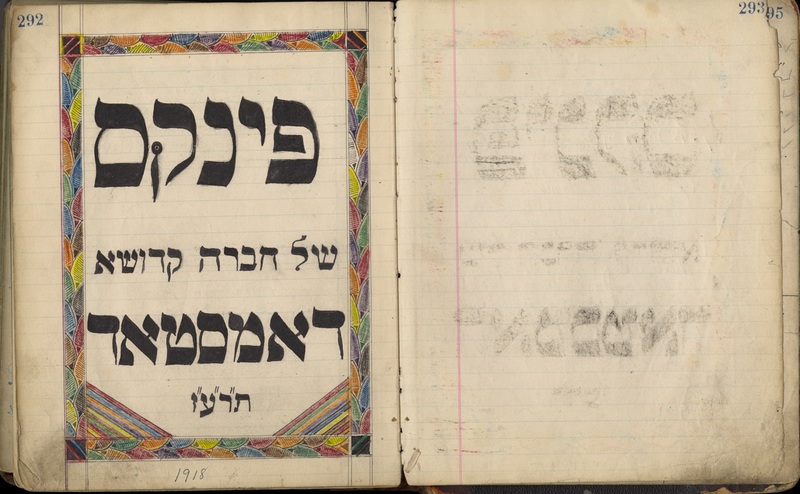 Upon the arrival in the United States of large numbers of Eastern European Jews that commenced in the last two decades of the nineteenth century, communal organizations modeled on European patterns were established in American Jewish communities…Most American pinkasim are standard large blank journal or account books purchased from commercial stationers…It was in the nature of American life that other forms of community organization would quickly supplant many traditional chevrot, but pinkasim recording their activities survive. In one example from 1911-1912, which documents a group within Philadelphia’s Congregation Atereth Israel, the artist, Benjamin J. Wexlar, surprisingly substituted a pair of northwest coast Indian totem poles as a decorative element in place of the more conventional columns. I cannot make out from this essay or from Google where this pinkas or any other American pinkasim are located, but as Aaron mentioned in his conversation with me, we must look at a number of these pinkasim together to better understand Homestead’s in context. 6When I was first soaring on the clouds of this discovery, I got carried away with my ideas about hiddur mitvah, but now that deeper investigation has brought me back down to earth, the explanation behind these pages could be as straightforward as: this is what everyone did. This book was created when the Chevra Kadisha first began to keep records, so they fashioned it as Jews had fashioned record books since time immemorial. 7 Moreover, I judged these pages as unique against the hundreds of other Homestead pages, but only now does it dawn on me that my sample is incomplete, because the earliest minute books for the congregation are gone. It is entirely possible — even likely, I begin to think — that the first volume of the congregation’s minutes began with pages similarly illuminated. My underlying curiosity around Homestead’s traditional pinkas has to do with discerning the blend of the old and the new in the congregation’s formation. 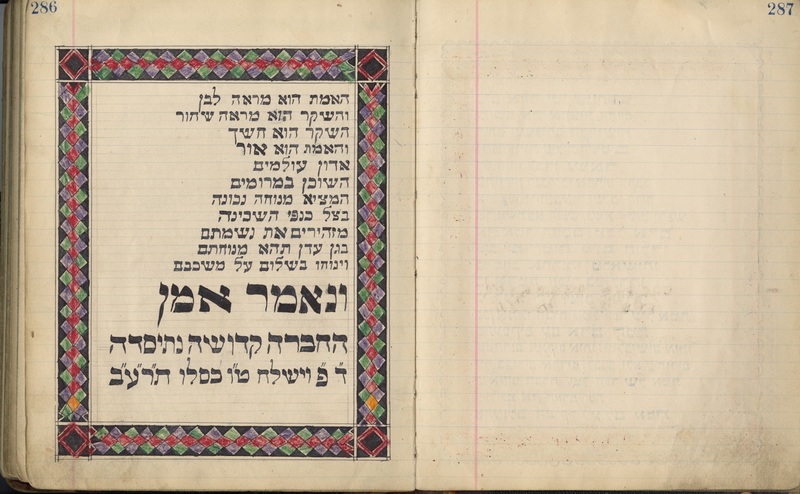 The Chevra Kadisha got traditional takanot (regulations) in 1912 where the main congregation had American-style bylaws since 1902. Why? In 1940 the Chevra Kadisha proposed to create its own constitution and by-laws, presumably to replace the original takanot. 8 What had changed? In Homestead’s early organization I see elements of the traditional kehilla (institutionalized Jewish community) the founders had left and the American fraternal groups a surprising number of them joined at a fairly early date. How exactly did these qualities weigh against each other in Homestead at the beginning and in later periods, what does that shifting balance say about our ancestors, and how did Homestead’s shift compare to other such communities? And more bewildering, while it’s understandable how the community’s founders would have known to put in place structures they had experienced in the towns of their youth, who knew to make this pinkas in this way? 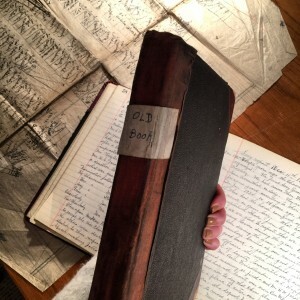 Given how these record books were traditionally venerated, it is my understanding that they were closely guarded by community elders in the shtetlach. 9 But, the men who started the Homestead congregation were young. How in their youth before they left the Old Country would they have learned about these semi-private traditions well enough to enact them without elders to guide them? All of these questions I would have asked even had there been no pinkas — there’s enough to wonder about in the boxes of English records and the rituals they record — but because it exists, this beautiful pinkas has become the clearest focal point for my awe and admiration at how these young men managed to reconstruct so much of the world they had left behind. The list of members uses everyone’s Hebrew names. In cases where I know the English first name the people commonly used, I added it in parentheses. Judging by the Chevra Kadisha‘s meeting minutes, there were many more members than who were listed here. This list was not kept up-to-date for very long after it was written. Encyclopedia of American Folk Art, p. 304. Examples of member pages from Eastern European pinkasim. 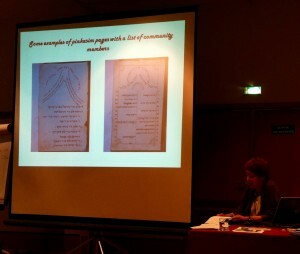 Photographed by me during a lecture at IAJGS 2012 by Iryna Serheyeva entitled, “The Pinkasim that the Vernadsky Library holds.” Click to enlarge. For reference, here is a list of some traditional pinkasim in a library in Kiev. In July 2012 I heard a lecture from the librarian responsible for them, which is how I learned about pinkasim in the first place. Such serendipity! Had it not been for her presentation, I would not have recognized the Homestead pinkas for what it was. Pinkas from Congrégation Tifereth Beth David Jérusalem in Québec. This page has a year of 1922 on it. In the introduction to Nathaniel Deutsch’s revelatory The Jewish Dark Continent: Life and Death in the Russian Pale of Settlement, the author relates how hard the ethnographer An-sky and historian Simon Dubnow had to work to collect pinkasim from communities reluctant to part with them. 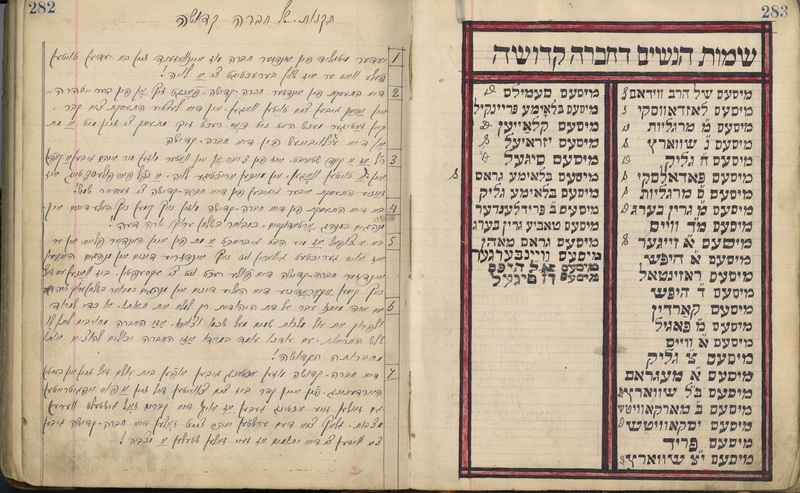 One story: “A family named Landsberg initially refused to part with a pinkas (record book) that had originally belonged to their ancestor, a religious judge who lived in the shtetl at the end of the eighteenth century… After gathering together the entire Landsberg clan, An-sky delivered such an impassioned plea that with ‘tears in their eyes’ the family members handed him the precious heirloom” (p. 22). This post covers January 1, 1913–December 31, 1933.